After going to a fancy shmancy restaurant months ago I fell in love with the flavor of truffles and luckily Trader Joe’s sells Truffle Oil. Before I started eating healthy i put it on everything but in an effort to clean out my pantry last weekend I found the bottle and I started drooling. I needed a healthier way to make it. This recipe only works if you NEED to add a healthy fat to you meal. It is definitely worth it to grill chicken plain just to make this! Preheat your oven to 450 degrees. On a cookie sheet place a piece of parchment paper and spray with pam. 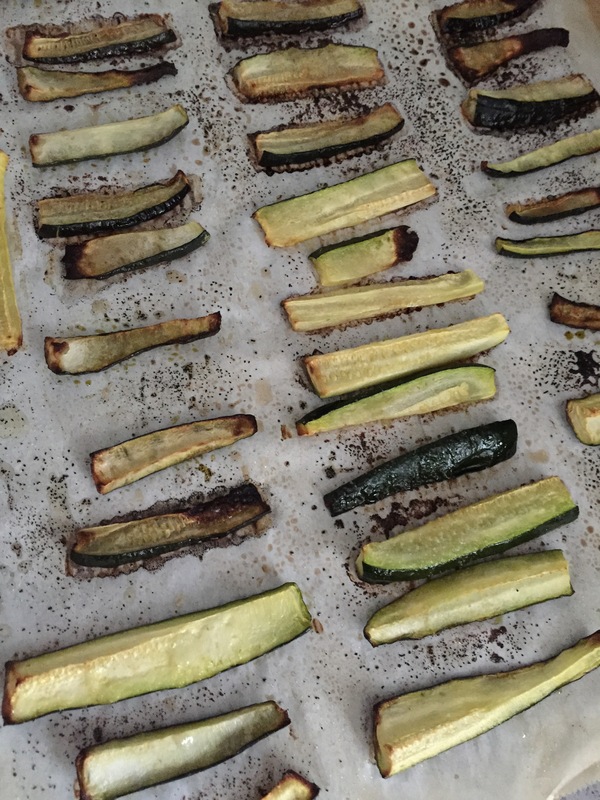 Slice the zucchini into even “french fry” slices. Lay them out with a little bit of space between them. Drizzle the truffle oil on them and then add the salt and garlic. LEAVE them alone. Do not toss or move around, i guarantee you the oil will spread on its own. Bake it in the oven for 20-25 minutes or until the edges are crispy and black. Take the sheet out of the oven and slide the parchment off the cookie sheet. Do not remove the fries until it is completely cooled. if you are going to reheat, make sure to do so uncovered.